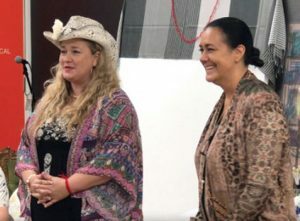 A great time was had by all at the global launch of ‘Apothecary medicine painting’ hosted in the Hawkesbury by Energy Medicine Institute, a place where ancient wisdom meets modern day science. Apothecary is a step by step process of using art to heal and transform tragedies into remedies, for both individuals and communities. The moment you arrived at Apothecary you were met with drumming, by Hands Heart & Feet from the Blue Mountains, introducing sound as medicine. Raw food creator Vicki Cook, walked us through the four directions of the medicine wheel exploring raw food as medicine. Elise Heyward from Timeless Tea walked us through the five elements of the medicine wheel exploring tea, as medicine. We had Giving Back as Medicine. 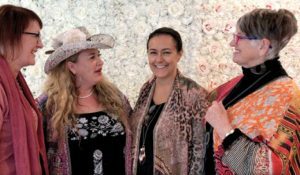 Tribal News, EMIs not for profit-Cambodian Project, Nary Style: a gift from the heart of Cambodia, selling 200 silk scarves with each scarf educating a child for 1 month. WomanSong sang us into the room, and to our seats, where the fabulous Chris Paine, MC for this event, lead the official proceedings. Chris was awarded a Medal of the Order of Australia (OAM) for her devotion to serving local government and the Hawkesbury community earlier this year. We had the honour of Stacey Jane Etal delivering the welcome to country. Susan Templeman MP then officially opened the global launch of Apothecary, a new healing modality. 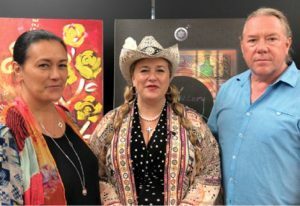 We are so grateful to Shiloh & Jonathan for not only allowing us to run the global launch of Apothecary in the Hawkesbury, but for Shiloh donating her painting to Tribal News where we raised over $10,000 for Tribal News, a not for profit resourcing women to change their community stories and Jonathan for donating his painting to ARC4PTSD to raise funds for their cause. We are excited to work with ACR4PTSD and other organisations who are focused on healing through expressive arts. If you would like to know more about Apothecary contact us at a[email protected]. Reprinted with permission from Energy Medicine Institute, Sydney, Australia. « A Virtual Art Opening for You!